» Transparent state? Not so much! Transparent state? Not so much! The happy couple in earlier times. One thing the Kitzhaber-Hayes story shows is that the governor’s judgment in running his office leaves something to be desired. Now it also illustrates that Oregon’s claim to run a completely transparent government is a sham. The public records law supposedly enables the voters to find out what their officials are doing in their official capacity. But we have allowed state and local governments to prevent timely access to official records to such an extent that the law has lost much of its punch. 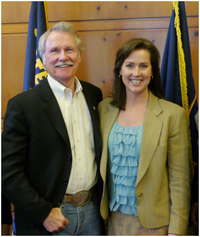 Governor Kitzhaber declared his girlfriend, now his fiancee, to be Oregon’s “first lady.” He gave her a desk in the governor’s office, a role as an adviser on energy policies and who knows what else, and a page on the governor’s official website. Then it developed that years ago she, in return for money, defrauded the government with a sham marriage to get around immigration laws. Then it further developed that she was paid by outside organizations as a consultant even as she worked as an adviser in the state administration. When Willamette Week and other papers started reporting this, the governor asked for a review by the state ethics commission. Apparently he himself is unwilling or unable to see that the consulting contracts were improper under the circumstances. Now, The Oregonian reports that the governor’s office has stonewalled requests for public records that would shed further light on the acivities and work relationships of Cylvia Hayes. The governor’s office has even, according to The Oregonian, interceded with the State Police regarding a media request for the log of visitors at Mahonia Hall, the governor’s Salem residence, and the police are delaying releasing the records pending a review of privacy and security issues. Meanwhile, the state Energy Department says it’s willing to comply with a request for records on Hayes’ work related to the department only if The Oregonian pays it $3,386, the amount the state claims it costs to review the papers first. What a crock! But this is common now. Requests for controversial or potentially embarrassing public records are often denied on the grounds of privacy or sidetracked with a demand for exorbitant payments, payments intended to discourage citizens from pressing their demands. Progressives believe that government is inherently a good thing. Therefore the more government the better. Progressives have taken over the Democrat Party lock, stock and barrel. Kitzhaber is the epitome of Progressivism and believes that whatever he does is for our own good because he is a Progressive and represents the good government does for/to us. Therefore we should not even question his actions. Many, if not most, of the people who work for government are also Progressive so they too follow the same credo. Their response is: why are you people questioning us? You have no reason to do so and we will not comply if we can evade or avoid it. Wake up America! Well said Mr. Hering. Now if only the majority of voters could see what a corrupt enterprise this governor and his “First Friend With Benefits” is running out of the Capitol building. Privacy versus the public’s right to know/information is a very dicey subject. Part of me thinks everything in the public “arena” needs to be 100% open, but I also get that some information should remain private, such as personal (not personnel) information with regard to employment in the public sector. By personal I mean private. Misconduct in the performance of one’s duties is NOT private, nor is it what I would call personal, despite the fact such misconduct may be a result of “personal” issues.. Non personal information should be available to the public, always. It should be understood that employment in the public sector might (and should) include public scrutiny of official conduct and that nobody can hide their conduct behind “privacy laws” now in place. That in itself might be a sort of deterrant to those contemplating unethical behavior. That Kitzhaber appears to be stonewalling on behalf of his significant other comes as no surprise. Citing privacy laws as his reasoning is now so commonplace that the public has become numb, and in so doing has effectively forfeited their “right” to know. And in many cases, the press (media) has abdicated its role in uncovering this information and reporting it through investigative journalism. Same old song and dance. Until the public (and the judges that make some of these “rulings”) and the press recognize and take back our right to know, things like this will continue to be swept under the rug at least until the election is over, or it is no longer a hot topic in the news. It happens daily at the national level. Our current President vowed he would run the “most transparent administration” in the nations history. As far as I can tell, this has been the most opaque administration, certainly in my lifetime, and he makes Richard Nixon look like a Boy Scout. The “fourth estate” is vital to our freedom and by giving Obama (or Kitzhaber) what amounts to a pass only infringes on our freedom. I’ve seen enough of Kitzhaber…..It’s time for a change. This game is also played by the City of Albany. Like you said – what a crock. The City of Albany sent GAPS a letter on June 13, 2001. Here is the paragraph that caused me to contact Hare. So, it appears there were two failed districts that pre-dated the extinct Gatorade district. Anybody in office should avoid any POSSIBLE APPEARANCE of impropriety.